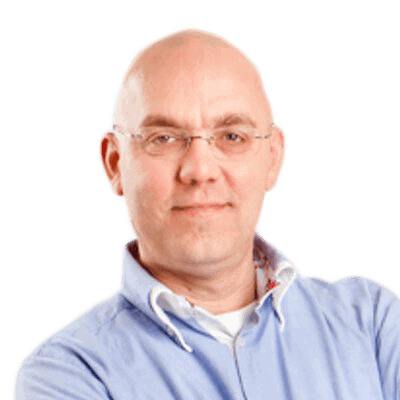 Having walked us through the initial steps of the migration from Exchange Server 2007 to 2010, Jaap now discusses the next stage of the process - Configuring External access to your Exchange environment, and setting up your new Exchange 2010 Mailbox Server. In my previous article, I showed you how to implement a coexistence scenario with Exchange Server 2007 and Exchange Server 2010, and how to change the SMTP message flow. In this article, we’ll continue the migration process and examine what steps we need to take with the Exchange 2010 Client Access Server and Exchange 2010 Mailbox Server. Specifically, we’ll need to modify how external clients can access our Exchange environment to take the temporary coexistence into account, and then we’ll be able to configure the Exchange 2010 Mailbox Server. Let’s take a look at those two processes now. Legacy.inframan.nl – this points to the old Exchange 2007 CAS Server after the switch to the Exchange 2010 CAS Server. It is used for when OWA clients are redirected to the Exchange 2007 CAS server because the user’s mailbox is still on Exchange 2007. Just to make sure we’re all absolutely clear on this, the webmail.inframan.nl FQDN will give access to the Exchange 2010 Client Access Server while the legacy.inframan.nl FQDN will give access to the old Exchange 2007 Client Access Server. Outlook Web Access for mailboxes still on Exchange Server 2007 will be redirected to the legacy FQDN. Reconfigure external DNS, and update the Publishing Rules on TMG. Follow the New Certificate Wizard to create a new certificate request, using the three hostnames I mentioned earlier. When you’re finished, use the Enable Exchange Services option in the actions pane. In the inframan scenario, only the IIS service is used by the new certificate. 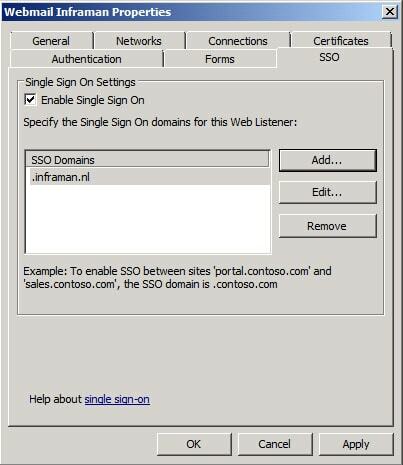 Bear in mind that, in Exchange Server 2010, usage of a wildcard SSL certificate is also fully supported. When the certificate is configured and working on the Exchange 2010 Client Access Server, the certificate is exported to a file on the local hard disk. This is a different file from the one we created in step 4 above; this is a backup file of the Exchange certificate. It is then imported to the Exchange 2007 Client Access Server and the TMG Server (which, if you recall, the company has upgraded to from an ISA Server, as mentioned in part 1). As mentioned earlier, one SSL certificate can be used on all servers. You should also bear in mind that, while changing the certificate on the Exchange 2007 Client Access Server and the TMG server is a small update, it will cause a small outage in the messaging service. 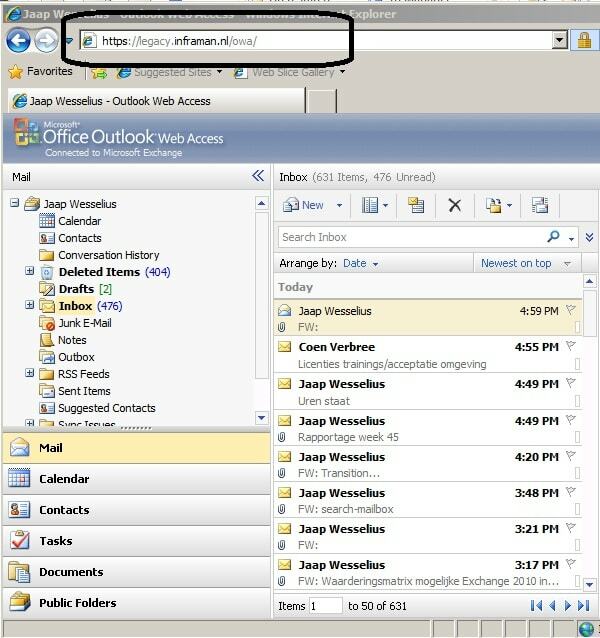 In the Actions Pane, click on Enable Outlook Anywhere. The wizard to enable Outlook Anywhere will start, and you should enter the external hostname (i.e. webmail.inframan.nl)here. Select the appropriate authentication mechanism, which in this example will be Basic Authentication. Click on Enable to continue the wizard, and a warning message will be displayed saying Outlook Anywhere will be enabled in approximately 15 minutes. Click on Finish to end the wizard. Right-click on the Default Offline Address Book and select Move, using the Browse button to select the Exchange 2010 Mailbox Server. Click on Move again to continue. A warning message is displayed, informing you that the files are copied to the new target server, at which point you can click on Finish to end the wizard. Right-click on the Default Offline Address Book again; select the property sheet, and then select the Distribution tab, where the 2007 Client Access Server is still listed. Remove the old server, and then click Add to add the Exchange 2010 Client Access Server as a distribution point. Finally, click on OK to apply the changes and close the wizard. The Offline Address Book is only generated once a day, by default at 4:00 am. So, when you are creating new mailboxes, you have to be careful as they might not show up in this OAB until the next day! On the other hand, the Client Access Server polls the Mailbox Server for updates on the OAB once every 480 minutes (8 hours). Be aware of these issues when troubleshooting OAB issues. The last step is to reconfigure the TMG web publishing rules for OWA, Autodiscover and ActiveSync, so that they all point to the new Exchange 2010 Client Access Server, and also to add the legacy host name to the external DNS, and point it to the external interface of the TMG Server. An important step here is to change the web listener, as it needs to provide the single sign-on mechanism that enables the seamless redirection from the Exchange 2010 Client Access Server to the Exchange 2007 Client Access Server. An ActiveSync client connects to the Exchange 2010 Client Access Server, and this server retrieves the mailbox data from the Exchange 2007 Mailbox Server using the RPC protocol. The Remote Connectivity Analyzer (RCA) can be used to test the Exchange configuration, and can be found on http://www.testexchangeconnectivity.com. Figure 2. OWA is redirected to the legacy FQDN while the mailbox is still on Exchange 2007. After installing the Exchange 2010 Mailbox Server, there’s some configuration that needs to be done. The first step is to change the default location of the Mailbox Database from the standard location (C:\Program Files\Microsoft\Exchange Server\v14\Mailbox )to a separate disk, which is not difficult. Select a location where the Public Folder database and its accompanying log files will be stored. 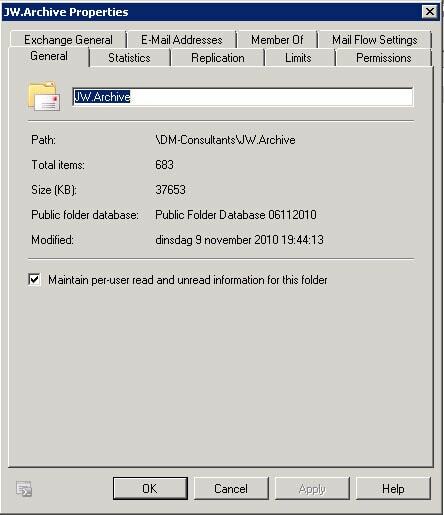 By default, the C:\Program Files\Microsoft\Exchange Server\v14\Mailbox directory is selected, but it’s a best practice to use another disk. Enter the new location and click New to create the Public Folder database and mount it. Now we need to configure the mailbox database on Exchange Server 2010 to use the newly created Public Folder database. To do so, select the mailbox database and open its properties. In the properties window, select the Client Settings tab. 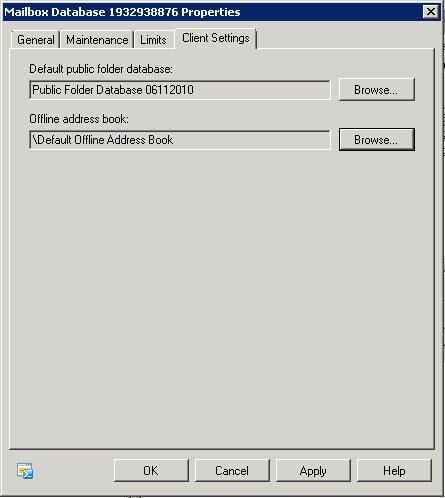 Select the 2010 Public Folder Database (the default is the 2007 Public Folder database) and select the default Offline Address Book. Figure 3. Set the default Exchange 2010 Public Folder database on the Exchange 2010 Mailbox Database. Don’t forget the OAB! To add the Exchange 2010 Public Folder database to the list of replicas, select a public folder’s properties and select the Replication tab. Add the Public Folder Database on the Exchange 2010 Server and click OK. Repeat this for all System Folders that are available on the Exchange 2007 Server (i.e. Free/Busy and Offline Address Book folders). AddReplicaToPFRecursive.ps1 -Server 2007MBX -TopPublicFolder "\"
This will add the Exchange 2010 public folder database as a replication partner on all public folders that are beneath the root folder. Public Folder replication is not the fastest mechanism in Exchange Server so, depending on the number of Public Folders and the size of the database, it can several hours (or, indeed, days) to complete. At this point, we still have a combined Exchange 2007 / Exchange 2010 environment, although the SMTP mail flow is now going through the Exchange 2010 Hub Transport Server, and all clients connect to the Exchange Server 2010 Client Access Server. However, since all mailboxes are still on Exchange Server 2007, the requests are either redirected to the Exchange 2007 Client Access Server (for OWA), or the Exchange 2010 Client Access Server is talking directly to the Exchange 2007 Mailbox Server. In the next (and last) article in this series, I will discuss moving the mailboxes to Exchange Server 2010, and how to finally decommission Exchange Server 2007. The articles are really good.Thanks for that. Please let me know where we can find the third part. what if I only have a CISCO firewall between internet and Exchange CAS array? How can I make sure 443 traffic arrive to both Ex2007 and Ex2010 CAS servers during the co-existence scenario? I do have legacy record in the public DNS side but not sure how it will work under the above mention scenario. To my understanding CISCO will simply forward 443 traffic to EX2010 CAS server. You clarification on this matter is appreciated. Question: I don’t have the privilege of TMG/UAG. How would I achieve SSO and automatic redirection from Ex2010 CAS to Ex2007 CAS using Websense? I am on a project and a quick response is highly appreciated. 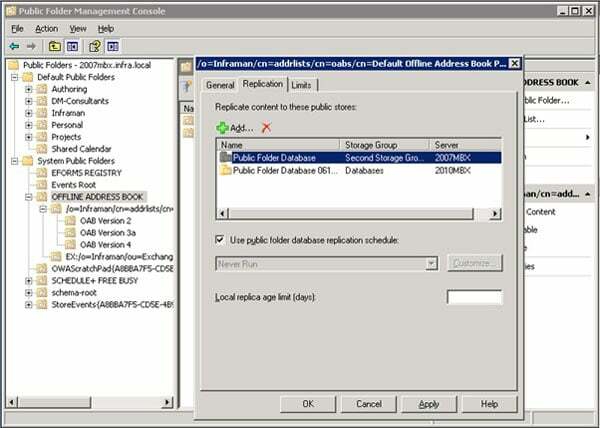 In "#3 The user Public Folders then need to be replicated to the Exchange 2010 Public Folder database as well. ", my question is since we have no custom public folder DBs, just system default that handles all the system stuff and free-busy, etc, do I need to do #3? Could you elaborate? I just want to make sure I don’t miss anything.